WESTBURY, NY--(Marketwired - October 08, 2015) - Refrigerant leaks are harmful to the environment and reduce the efficiency of the air conditioning system. Low levels of refrigerant in the system can cause compressor failure. The importance of catching leaks early cannot be over-emphasized. As the inventor of fluorescent leak detection, Spectronics Corporation manufactures an extensive line of products for refrigerant leakage. 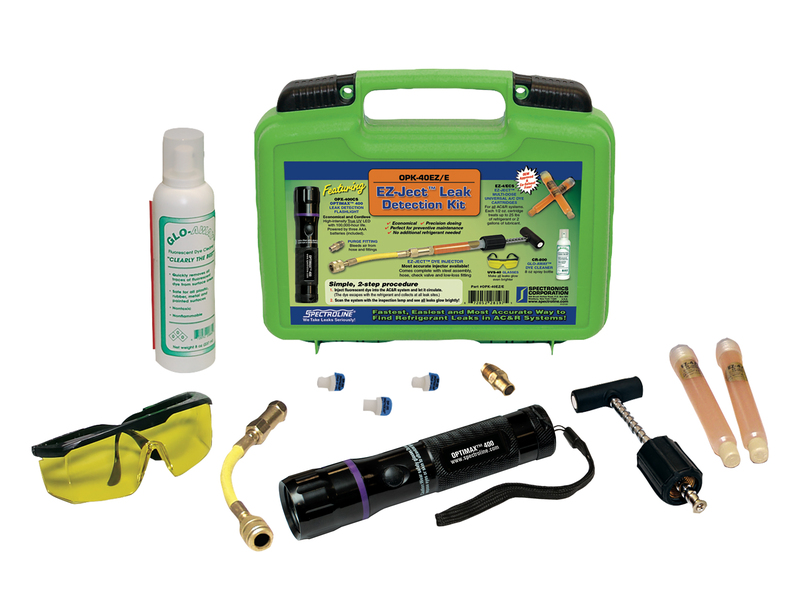 Spectroline® OPK-40EZ/E EZ-Ject™ Leak Detection Kit comes complete with everything needed to accurately and quickly find leaks in small to medium size AC&R systems, including high-pressure R-410A systems. The multi-dose fluorescent dye capsules are easy to use and super-economical. At the heart of the kit is the OPTIMAX™ 400 LED leak detection flashlight. Its high-output violet light LED causes dyes to fluoresce more brilliantly and with greater contrast than conventional blue light lamps. The OPTIMAX 400 has an inspection range of up to 25 feet (7.6 m) or more. The LED has a 100,000-hour service life. In addition to the lamp, the leak detection kit includes an EZ-Ject™ dye injector and two multi-dose universal/POE dye cartridges that each treat up to 2 gallons (7.6 L) of lubricant or 25 lbs (11.3 kg) of refrigerant. The fluorescent dye can be added with the system off orrunning. Also included in the kit are a hose assembly with check valve and low-loss fitting, a purge fitting, an 8 oz (237 ml) spray bottle of GLO-AWAY™ dye cleaner, three drip plugs and fluorescence-enhancing glasses. All components are conveniently packed in a rugged carrying case.